This time I am going to compare two very powerful and inexpensive vocal stage microphones from Sennheiser – e935 and e945 which are specifically designed to perform under pressure. They are not competing with each other, but rather are designed for different uses. Continue reading to find out which model is more suitable for you. Both models are very similar in design and weight just over 350 grams. The Sennheiser e935 is slightly heavier and longer than e945. While not particularly heavy, the mics feel solid and well constructed. They have a solid, metal body which protects them from unexpected damages, such as mic drops, that can happen during a performance. The metal body assures that the mic is safe even after the fall. They can withstand a huge amount of abuse and harsh weather conditions. Sennheiser gives you a 10-year warranty to let you know that the mics are top quality. When you use a handheld mic, there is usually a lot of shuffling and handling. It can disturb what you have to say and give your listeners an unpleasant experience. These mics offer a shock-mounted capsule which is very useful in minimizing the handling noise. Both mics are dynamic. This means that you can use them without power supply. You can move around freely without worrying about a cord. e935 and e945 in comparison to Shure SM58 are more sensitive and offers a greater amount of detail. If you used SM58 before you’ll find that the microphones from Sennheiser are very different mics: smoother, warmer, brighter, with better clarity, where SM58 sounds more muffled. Shure is a sharper mic, meaning that flaws in your voice will not be hidden. 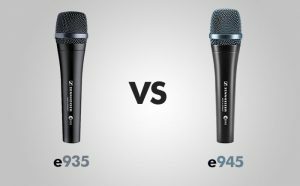 e935 and e945 are more sensitive mics than Shure SM58, so you have to restrain yourself from excessive handling. e935 is a very versatile mic that sounds great for both high female and deep male voices, and because it’s a cardioid microphone it sounds more natural than its supercardioid brother – e945. 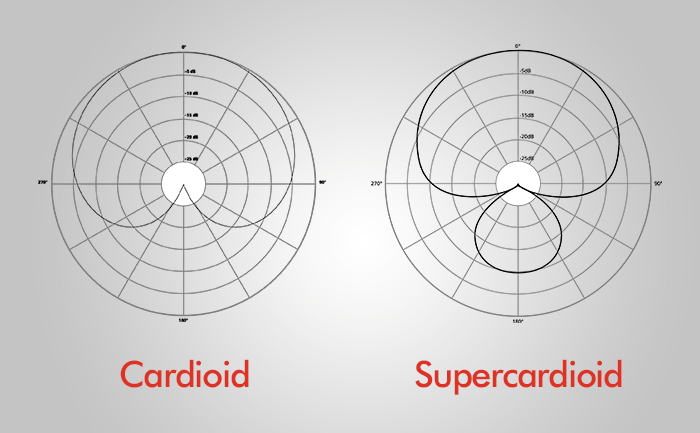 Cardioid microphones offer less proximity effect, therefore they may sound a bit more natural, while supercardioid mics offer superior sound rejection. e945 sounds great for female and tenor voices. However, for bass singers the proximity effect makes their voice exaggerated. People who have a low voice should consider e935 instead. Both models offer a humbucking coil, which reduces a humming noise. This noise is caused by electrical interference from smartphones, speakers, and other devices which cannot be avoided when you performing on a stage. This can be very irritating to the listener. The Sennheiser microphones are enhancing voice and deliver it stronger and clearer. e935 has the sweet spot. It’s a very versatile mic that can work for everyone. Doesn’t matter whether you have a high female voice, low baritone or tenor. It works not only for jazz clubs but also for moderately loud stages. e945 is preferable for back vocals because it produces less bleed. As a supercardioid microphone, it favors the side placement of speakers where the singer is in the middle and slightly aback. It can handle concerts, shows and loudest stages without a problem. Both of them can also be used for home studio recording and outdoor events. PROS: Natural sound / Great amount of detail / Suitable for all kind of voices / Resistant to feedback / Durable / Very affordable / 10-years warranty. PROS: Decent gain before feedback / Very good noise reduction / 10-years warranty / durable. CONS: None. CONS: Probably not for bass voice.